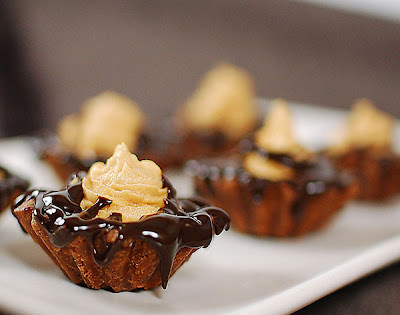 Wow, those look like the best chocolate peanut butter cups I will EVER eat. O M G it looks like heaven!! I have been a lurker here for a long time. I also love red velvet cake and lava cake and I LOVE your writing style. You almost always make me smile. Looking forward to more great posts. Mmmmm! Tony sure knows how to pick'em--both recipes and women. Thanks for making me smile! I saw these on Tastespotting and I had to click! Yum! OMG, actually burst out laughing several times during this one. You're really on a roll today. Thankful I finished my soda as it would've been spouting out my nose. Yum, those look and sound fantastic! Tony's no dummy! I might have seen that same suggestive look on my Honey's face a time or two and then I remind him that the door's not locked. (kids!) I crack up everytime I see that crestfallen look he get after I tell him. LOL! I'm literally drooling all over my keyboard. Dang, those look delicious! 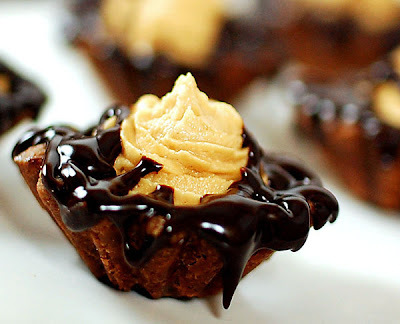 Seriously, keep on baking the PB choco treats, you have a serious knack for them. Hahahaha I love the story. The tartlets look delicious. And I can sympathize with the chocolate peanut butter combo. Anytime I ask my bf what he wants me to bake it's a choco PB combo regardless of it's form. The story is hilarious! And no you aren't crazy about the sixth sense, I get it too. Usually mine hits, when I'm grabbing coffee. Tarts look fabulous and gluttonous! Heeee! Loved your description of that guy! Damn you woman! You are making me fat!!! Oh, thank goodness, I'm out of cream cheese or I'd have to call in to work and make these right now. Gracious. I know what you mean about the sixth sense - I trust mine more than anything else. Unless I'm PMS-y, then I think *everyone* is type-A, uptight and pretentious, when for goodness' sake, they just want a burrito. Speaking of which - I didn't go to Chipotle, but a friend and I went to a fish taco place last night, and I had a tuna wasabi burrito, with aioli. Holy moley, it was good. So good, I had the leftovers for breakfast and wish I had more. oooooo-weee, they look luscious! perfect little bites. Well the fellas in my head who run my 6th-sense radar tell me these pb-choc tartelets are great! Tony toatlly deserved them for not being that guy! 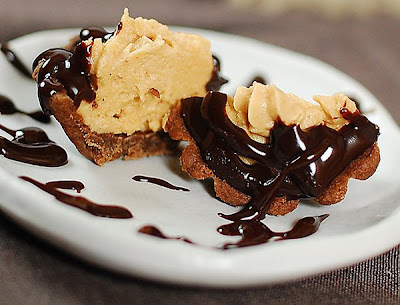 this is fantastic, especially for me, a person who is addicted to the combination of chocolate and peanut butter. and those photos are mind blowing! These little things couldn't possibly be fattening! Look how innocent they are in their cute widdle tart shells. How could anything so completely darling be bad for me? Don't answer that. Just ignore me licking the screen. Oh, and I am so with you on that tight-assed prig at the burrito shop. I can't stand those guys -- slightly balding with frosted hair that's all spiked up and they drive a Jeep or a Hummer or something with jeans that they purchased pretorn from Abercrombie. Yeah, I've seen those guys and had to be held back because all I want to do is tell them how revolting they are and how no one is fooled into thinking that they aren't washed up middle aged farts instead of twenty-one year old frat boys. Sixth sense? - all I hear in my head is "I see dumb people". I always want to park right up close to them just to irritate them! And I'm guessing there is a more technical definition for "bake blind" than keeping your eyes shut? Good thing or I would totally have to eat all of these myself! Tee-hee! You said pie hole. best saying EVER. Where did you get that first statement from? I just wanted to read more on that subject as I know "exactly" where you're coming from. Anywho, these little precious gems are pure evil and that's a good thing! That or he's secretly taking blood pressure pills....who knows? Or who cares? Well, I at least hope Tony got a taste of those anyway! omg, ann we should have drink together. seriously. i need to see this radar in action. i never laughed so hard in life before! And DOUBLE OMG WOMAN!! Chocolatey peanut butter thingy drippy tarty things! Get thee in my pie-hole INDEED! A hearty Homer-esque "Arrgghhhhhhhhh!" Those look totally delicious - I need to try one. Yummy. I was just informed that you have some great peanut butter recipes and you didn't let me down! This look fabulous! I want a big scoop of that filling! Holy God this looks good, and oh my god I think I know the guy you were standing next to (we probably all know "him"). This recipe reminds me a bit of my best friends' momma's peanut butter chocolate cake she makes every festive occasion. It's not so much a cake as it is a tart.